For individual houses called "Lustron House", see Lustron House (disambiguation). Lustron houses are prefabricated enameled steel houses developed in the post-World War II era United States in response to the shortage of homes for returning GIs by Chicago industrialist and inventor Carl Strandlund. Considered low-maintenance and extremely durable, they were expected to attract modern families who might not have the time or interest in repairing and painting conventional wood and plaster houses. In January 1947, the newly formed Lustron Corporation announced that it had received a $12.5-million Reconstruction Finance Corporation loan to manufacture mass-produced prefabricated homes that featured enamel-coated steel panels (U.S. Patent 2,416,240). Led by Chicago industrialist and inventor Carl Strandlund, who had worked with constructing prefabricated gas stations, Lustron offered a home that would "defy weather, wear, and time." Strandlund's Lustron Corporation, a division of the Chicago Vitreous Enamel Corporation, set out to construct 15,000 homes in 1947 and 30,000 in 1948. From its plant in Columbus, Ohio (the former Curtiss-Wright factory), the corporation eventually constructed 2,498 Lustron homes between 1948 and 1950. The houses sold for between $8,500 and $9,500, according to a March 1949 article in the Columbus Dispatch—about 25 percent less than comparable conventional housing. By November 1949, however, a Lustron's average selling price had come up to $10,500. Most of the known Lustron houses were constructed in 36 of the United States including Alaska. However, some were constructed in Venezuela for families of oil industry employees. Billed as a way to maximize pleasure and minimize work, Lustron advertising contended that the Lustron home would create a "new and richer experience for the entire family," where "Mother...has far more hours," the "youngsters...have fewer worries," and there would be "far more leisure for Dad." How this would be accomplished with just a choice of housing was not clarified, although presumably, it was through enameled-steel design that would not need painting. The Lustron design was created to adapt it to mass production. A steel framing system was devised consisting of vertical steel studs and roof-ceiling trusses to which all interior and exterior panels were attached. The concept of prefabricated housing was well established by firms such as Alladin, Gordon-Van Tine, Montgomery Ward, and Sears in the early 1900s. These companies, however, used conventional balloon-framing techniques and materials in their kits. After WWII, the domestic demand for steel exceeded production and the federal government exercised control over its allocation. Strandlund had orders for his porcelain-enameled panels for use in construction for new gas stations for Standard Oil. He made a request for allocation of steel but was denied. However, he was advised by Wilson Wyatt, Housing Expediter during the Truman administration, that steel would be available if Strandlund produced steel houses instead of gas stations. Wyatt endorsed the idea but was unable to convince Congressional members to appropriate funds for Strandlund. In turn, Wyatt resigned his post, but other influential members of Congress were successful in getting support to finance the production of Lustron homes. Through the government agency, Reconstruction Finance Corporation (RFC), Strandlund ultimately received over $37 million in loans plus a leased war surplus plant in Columbus, Ohio. This was the first venture capital loan made by the federal government. Initially, Strandlund was provided the availability of a war surplus plant in Chicago. However, due to the political intrigue in government, Tucker, who proposed to produce a radical new automobile, acquired the plant. In turn, Tucker shortly failed in his business operation. The political ramifications are as fascinating as the engineering of the Lustron homes. The Lustron factory had approximately eight miles of automated conveyor lines and included 11 enameling furnaces, each of which was more than 180 feet long. The plant equipment included presses for tubs and sinks. The bathtub press could stamp a tub in one draw and could produce 1000 tubs a day at capacity. Specially designed trailer trucks were used as the final assembling point where the manufactured parts came off the assembly line. There were approximately 3300 individual parts in a complete house loaded on a single trailer. The trucks then delivered the house package to the building site. Lustron established builder-dealers, which in turn sold and erected the house package on a concrete foundation. In 20 months of production and sales, Lustron lost money on each house, and in turn, was not able to repay the RFC loan. RFC foreclosed on Lustron and production stopped on June 6, 1950. On the Lustron order book were contracts for more than 8000 housing units, which were never shipped. Arguably the most popular of the Lustron homes was the two bedroom, 1,021 square feet (94.9 m2) "Westchester Deluxe" model. In total, there were three "models" of Lustrons: the Westchester, Newport, and Meadowbrook. With the exception of the Esquire (which had been the prototype's name) each Lustron type was available as either a two- or three-bedroom model. The decorative "zig-zag" accent is unique to Lustron homes. Prefabricated housing had existed before the Lustron home came on the market. However, it was Lustron's promises of assembly-line efficiency and modular construction that set it apart from its competitors. The homes were designed by Morris Beckman of Chicago firm Beckman and Blass, and may have been loosely based on designs for the Cemesto houses in Oak Ridge, Tennessee. With enameled steel panels inside and out, as well as steel framing, the homes stood out next to more traditional dwellings made of wood and plaster. Lustron homes were usually built on concrete slab foundations with no basement. However, about 40 Lustron homes have been reported to have basements. Their sturdy steel frame was constructed on-site and the house was assembled piece-by-piece from a special Lustron Corporation delivery truck. The assembly team, who worked for the local Lustron builder-dealer followed a special manual from Lustron, and were supposed to complete a house in 360 man-hours. The Ohio Historic Preservation Office recognizes four exterior colors: "Surf Blue," "Dove Gray," "Maize Yellow," and "Desert Tan." Reported in error over the years is that Blue-Green, Green, Pink, and White were available. Window surrounds were primarily ivory-colored, although early models used yellow trim on "Surf Blue" models. There were two major window types in Lustron homes: “tripartite” and casement, all manufactured by Reynolds Aluminum. The tripartite consisted of a central light flanked by two four-light casement windows. Three-light and/or square aluminum casements with interior screens were standard on all Lustrons. Add-on storm windows were available for residents in colder climates. Westchester Deluxe two- and three-bedroom models were unique in that they boasted a tripartite bay window in the living room area: no other Lustron line included this feature. In Westchester Deluxe two-bedroom models, additional tripartite windows were located in the dining area and bedrooms. For Westchester Deluxe three-bedroom models, tripartite windows were found in the dining area and two of the bedrooms, as well as the living room bay. Though the Westchester Standard line had no bay windows, it had tripartite windows in the same rooms as the Westchester Deluxe two-bedroom model. Newport two- and three-bedroom models, which had no bay windows, offered tripartite windows in the dining/living room area. A model of the Meadowbrook home shows that the design would have provided two tripartite windows, both in the dining/living room area, similar to those in the Newport line. In most models, the homes were heated with an oil burning furnace that directed hot air into an enclosed space above the metal ceilings. The walls contained a one-inch blanket of fiberglass wool insulation. Later production models of the Newport use a forced-air system. Among noteworthy Lustron exterior features are the siding consisting of square segments of material, followed by a zig-zag downspout trellis on the buildings' front and rear corners. In the two-bedroom Westchester models, the downspout attaches via the trellis to a pillar that supports the open porch. Rust has often led to removal of the trellis by owners. The largest assembly of Lustrons in one geographic location was in Quantico, Virginia, where 60 were installed at the U.S. Marine Corps military base. All Westchester Deluxe models, they came all four colors." Major remodels in the 1980s resulted in some of them being painted pink and lime green. In January 2006, it was announced that the homes, which had grown "too small for most families," would be eliminated from base housing and would be given away. Fifty-eight of Quantico's Lustrons were offered for free (with an application and $8,000 deposit) in 2006, yet only one individual came forward and acquired a home, which was disassembled and moved to storage in Delaware. Twenty-three of Quantico's Lustrons were demolished in 2006, and an additional thirty-four homes were razed in 2007. The two remaining homes at the base are on the National Register of Historic Places, and are currently used as maintenance buildings. About 2,000 Lustron homes are still in existence in 36 states. Many have been modified with additions, remodeled kitchens, vinyl windows, composite roofs, new heating systems, sheet rock interior walls, painted exteriors, and siding. Some have been dismantled, relocated and reassembled. A restored Westchester Deluxe (sans ceiling and roof) from Arlington, Virginia, was reassembled inside the Ohio History Connection in Columbus, Ohio, in 2013. It had been partially assembled (no bedrooms) for a few months in the Museum of Modern Art (MOMA) in Manhattan. The house is on display until December 2018 in Columbus. A small group of Lustron owners are preserving the original condition of their homes and are urging others to do the same, and a significant number of entirely original Lustron homes exist. Over time, Lustron owners often removed the "Thor" brand combination washing machine/dish washer, and in cold regions, the ceiling's radiant heat systems were often replaced. Demolition continues to threaten Lustrons where rising property values attract buyers who desire larger homes of newer construction. Other major threats to Lustron homes' integrity include: severe weather (tornadoes, hurricanes), vehicular or other impact, and lack of local zoning/preservation/aesthetic legislation. Lombard, Illinois, in Dupage County had the most Lustron houses at 36. In Mount Morris, IL, 13 of the town's 18 Lustrons are located on Sunset Lane, First Street and Hannah Avenue, within walking distance of one another. There is one Lustron house included as a contributing property in the Euclid Avenue Historic District at Bristol, Virginia. ^ a b c Reiss, Robert. "When Lustron Lost its Luster," The Columbus Dispatch. 23 July 1978. ^ a b Lustron Corporation. "Compact, Beautiful Lustron Homes: Newport Two-Bedroom and Three-Bedroom Sizes." Company brochure. ^ The plant would later be returned to aircraft production by North American Aviation as Air Force Plant 85. ^ a b c d e f Overmyer, Beverly; Coambs, Norris and Harriet Lustron House, Coambs-Morrow House; 92001165; National Register Inventory—Nomination Form, September 17, 1992, in digital files of National Park Service, Washington, D.C.
^ a b Boyd, Michelle Anne. “Preserving the Lustron House: Authenticity and Industrial Production.” Master's Thesis, Columbia University, 2001. ^ This table has been adapted from Boyd, Michelle Anne. “Preserving the Lustron House: Authenticity and Industrial Production.” Master's Thesis, Columbia University, 2001. ^ Prudon, Theodore H. M. Preservation of Modern Architecture. New York: John Wiley & Sons, 2008. ^ LustronRegistry.org, Accessed July 2009. ^ a b Mitchell, Robert J. "Whatever Happened to Lustron Homes?" APT Bulletin, Vol. 23, No. 2, 1991: 44–53. ^ This "bay" window measured 12 inches (300 mm) by 8 feet (2.4 m). ^ Hedgpeth, Dana (23 January 2006). "Housing History for the Taking at Quantico". The Washington Post. p. D3. Retrieved 8 May 2017. ^ Miroff, Nick (30 September 2007). "Lights Out for Lustrons of Quantico". The Washington Post. p. T3. Retrieved 8 May 2017. ^ Miroff, Nick (16 July 2006). "Even for Free, Metal Houses Lack Magnetism". Washington Post. Retrieved 8 May 2017. ^ Teresa Douglass; Phil Thomason; Peggy Nickell; Ellen Giese (November 2005). "National Register of Historic Places Inventory/Nomination: Euclid Avenue Historic District" (PDF). Archived from the original (PDF) on 2012-09-26. Retrieved 2013-06-12. 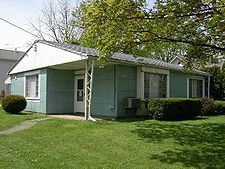 Wikimedia Commons has media related to Lustron houses. 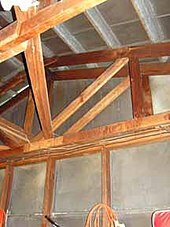 LustronPreservation.Org features the history, photos, locations, preservation guidelines and construction drawings. Was initiated by the US National Trust for Historic Preservation. Lustron Discussion Group Join Lustron owners, future owners and historians of these Homes of Steel and discuss their past, future and preservation. Includes news items, repair and maintenance, photo sharing, Lustron ownership discussions. The Illustrious Lustron: A Guide for the Disassembly and Preservation of America's Modern Metal Marvel Available for download. Includes photographs and historical information. Based on the disassembly of the "Krowne Lustron" of Arlington, Virginia. Arlington's Lustron Houses. The story of Arlington, Virginia's Lustrons, and their "Krowne Lustron" which was donated, disassembled, stored, and then partially reconstructed inside the New York Museum of Modern Art for a three-month exhibit in 2008. Lustron.Org website for the 2003 Emmy-winning film "Lustron, The house America's Been Waiting For." The Prices Make These Model Homes A Steel. A 2006 news article about the Quantico marine base Lustrons being given away. Lustron On-Line (2008-02) by NCPTT of the National Park Service An article describing the need for, and the development of the www.lustronpreservation.org website; link shown separately at top of this listing. The article is prepared under the National Center for Preservation Technology & Training - Architecture & Engineering.